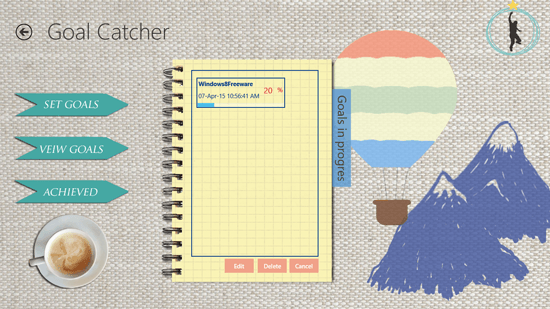 Goal Catcher is a goal management app that can work easily on your Windows 8 and 8.1 computer. It is free to download and use on your desktop. We all know everything works when we have our priorities set and goals to be achieved made. It is difficult to track how your goals are working and how your all round progress is. Goal Catcher helps you in setting not only the goals and priorities but it also helps in keeping a track of how you are working towards the fulfillment of the goal. In the goal management app, Goal Catcher the options for goals include Set Goals, View Goals and Achieved. You can add new goals by clicking on Set Goals. Every goal has option of adding the goal name followed by the five steps to reach your goal. After you have added the goal, you can see it in the list of goals under the option View Goals. As you keep completing the tasks mentioned in the goal you can keep editing it and ticking the tasks done. After every task you have completed, the goal management app will show you the percent of work you have successfully completed. The user-interface of this goal management app has been beautifully designed. It has a textured pattern as the background on which there is a diary kept. 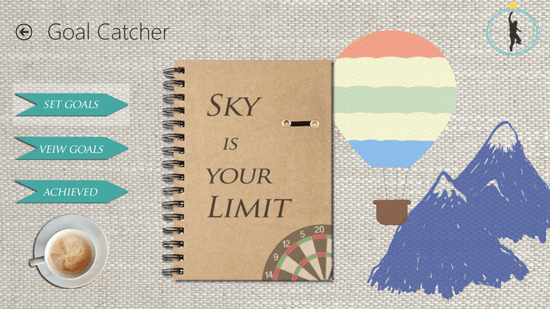 The diary has a really good quotation on it that says “sky is the limit”. The color scheme of the entire goal management app has been very well chosen, it does not feel like some colors are not right or are too bright. The colors are subtle and simple with the clean interface of the app. You can get a lot of output from your own goals and priorities with this great goal management and tracking app.